When a situation is good enough you can be tempted to just continue holding status quo in that comfortable, not-quite-perfect space. The trouble with doing the things you’re used to, in a space that is familiar and a routine that you might be able to do with your eyes closed, is that it is a breeding ground for inertia. Being comfortable can stifle you. It’s beneficial to shake things up. Insert some Strange that will perk up your ears and heighten your senses. But when do you say “enough!” to good enough? Once upon a time, in a land far, far away (Vancouver, BC), I had a large, square-ish shaped studio that I used to regularly re-organize. I had made custom storage/work tables that were on wheels so change-ups were easy and quick. Every year or so I would completely shift the orientation of my worktables and swap the inspiration, research, and artwork that I displayed on my walls. It felt like an injection of fresh energy, allowing me to approach my practice from new perspectives. Moving my life and practice to New York meant downsizing and moving into a much smaller studio. A small studio has made me more mindful and precious of space. I’ve become a master of vertical storage! 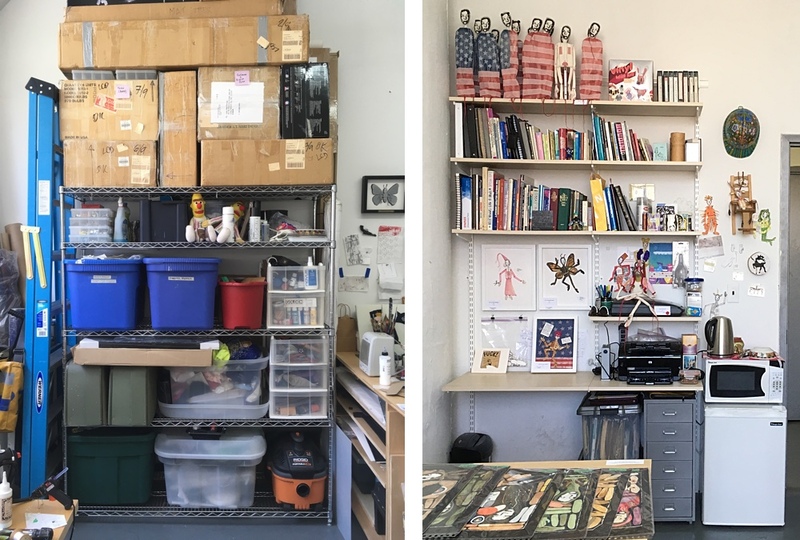 The footprint of my current studio is narrow and long and, although I built smaller versions of my wheeled worktables, the set-up I’ve had for the four years I’ve been here has remained largely unchanged. This studio isn’t the optimal shape for room-reorganization so I’ve been caught in a comfortable, but inflexible, environment. The heating in my studio building is funky and out of my control, much too hot in the winter (many days I come in and it is 90F in my room) and humid in the summer (having an air conditioner is only a bonus when you’re at the space and can turn it on). Comfort level aside, I worry about what the constant fluctuation in temperatures is doing to my materials and artwork. Ownership of the six-story building changed hands a few years ago and disruptive construction projects have been the norm over the past 18 months. We have a brand new entrance (hurrah!) but the bathrooms on our floor have been sliding into disgusting decline. Power is limited with only one outlet in the space and it is REALLY easy to trip the breaker with my mini fridge plugged in and the air conditioner on. If I want to turn on/use another appliance I have to unplug or turn something off. Management isn’t totally transparent about rent increases. Might be 5% when your lease comes up, might be 10%. I also discovered that it’s not consistent from one studio/one tenant to another, which seems, ahem, impolite. Last month I heard that a new studio building was going to be ready for occupancy coinciding with the end of my sublease. I decided to go for a look. 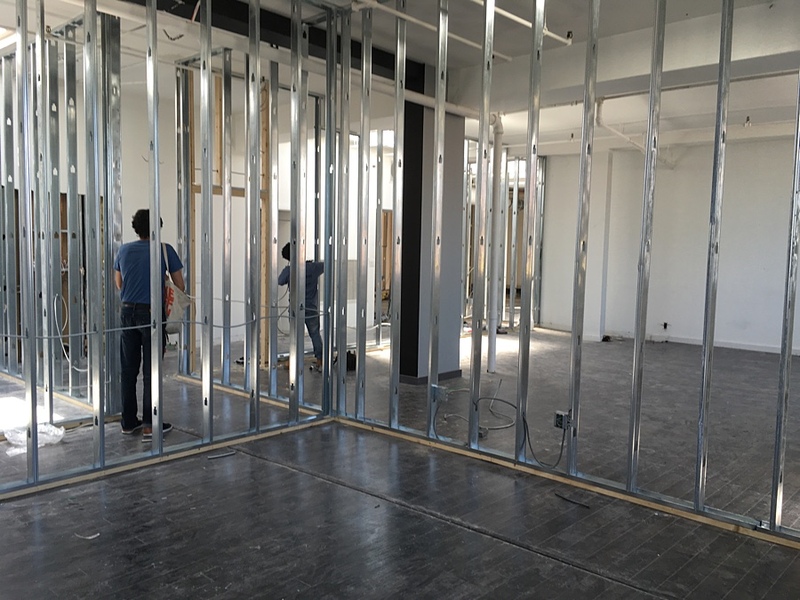 The 11 newly built-out studios will occupy the entire second floor of a two-story building. Every space has natural light (window and/or skylight), outlets on each of the four walls, laminate floors (I don’t mind concrete, but when I fall off my 12 foot ladder I’d like a slightly softer landing), clean, functioning bathrooms, and – best of all – HVAC. Regulated heating and cooling is the main reason I’ve taken the big leap and put down a deposit on a new studio space [insert high-pitched, panic-induced laughter here]. I’m rather resistant to change so it took a lot of pro vs. con list-making for me to come to this decision. In the end I concluded that I wouldn’t regret moving. View of the transforming space with my back to my new studio window. View of the new studio from the door. Why, yes, that is a beautiful, big window! I’m truly grateful for my current studio and it will be bittersweet to leave it. I’ve made good work here. 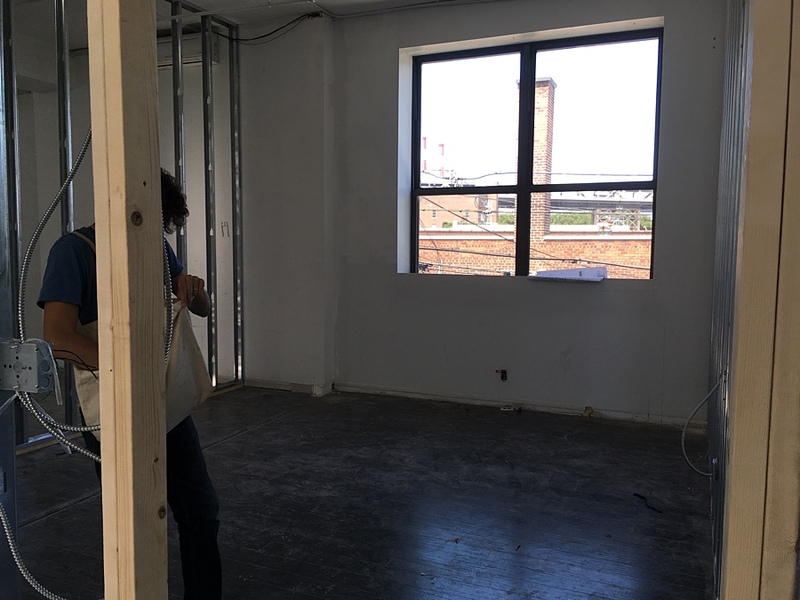 The new space is also 229sf, but is a different shape – more square. The footprint will allow me more flexibility in shifting my room around when the fancy to alter my perspective strikes me. Now is a good time to say “enough” to good enough. I’m ready for better. Are you settling for “good enough”? Could you/would you make changes to your situation that could make it better?